Avalon Wood Flooring hardwood refinishing restores dull, worn floors so they look as they did when first installed. Avalon Wood Flooring is the preferred choice for homeowners in the Orange County, CA area when their hardwood floors need refinishing. Hardwood floors have become increasingly popular because they are available in a wide array of styles to complement any interior design plan. Nevertheless, no flooring is immortal, and hardwood will eventually lose their original luster from foot traffic, stiletto heels, soccer cleats, spills, direct sunlight, relocating heavy furniture and even active pets. All of these daily events will inevitably wear down the finish and cause it to lose its original shine. The good news, however, is that Avalon Wood Flooring offers affordable hardwood refinishing services to homeowners in Santa Ana, Irvine, Newport Beach, Corona del Mar and other nearby communities in Orange County. When new hardwood floors are initially installed, the wood is covered with a durable polyurethane coat that protects it from spills, abrasive dirt, and wear caused by constant foot traffic. This urethane coating also contains some very tiny flakes of aluminum oxide which are added to this finish to increase its protection, durability and also to limit damage from the UV component in direct sunlight. 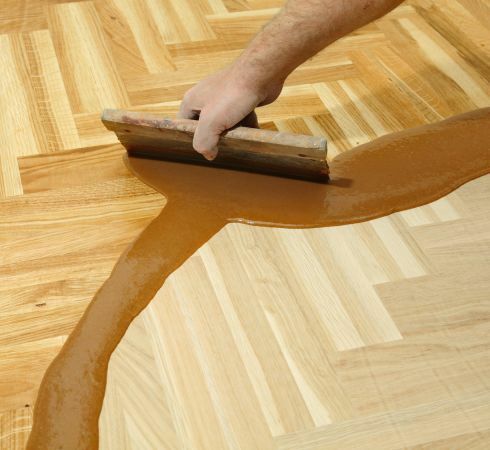 This protective material also increases the luster of the flooring. Sand, dirt and other abrasive particles are carried inside your home on people’s shoes, or by pets. These particles work just like sandpaper would by slowly scraping off the protective polyurethane coating over the hardwood. Once the coating is gone, soil and water can soak down into the wood itself, resulting in swelling and some discoloration. In addition, UV radiation contained in direct sunlight entering the room will bleach the rich colors from a hardwood floor, making it appear dull and unattractive.